I wrote a while back about doing a joint announcement with a competitor. Communications wise, it was from the standpoint of Analyst Relations. Since I also did Public Relations for many years, I had the opportunity to lead an announcement with Microsoft and Intel. Recently I came across a press release that I had coordinated on behalf of the Netfinity Server (System X now, update: It has been sold to Lenovo) with Microsoft and Intel in the early 2000’s. In reality, all the work was done between Waggener Edstrom for Microsoft and me for IBM. All other parties weren’t interested enough to contribute as long as their name and content was in the release. It was done to best Oracle in the TPC-C benchmark category (there are multiple TPC benchmarks but this one worked for effect). While the machines pale in comparison to recent server announcements, it was quite an achievement in 2001 terms. The code name internally at IBM was Firestorm and had the high priority and secrecy of a CIA mission with me having to sign a non disclosure agreement that expired on announcement day just to know about it. We had weekly internal meetings to cover the progress as what was at stake was having DB2 exceed Oracle in database transactions, basically one-upmanship in a bake-off. I coordinated it for IBM even though there was a Software Division product at stake. Since it was run on an IBM server, that established what the importance to the company was and to this day servers are still a critical product to the company (you can’t run software or have services without one). I told the then PR manager for DB2 that I would run it for them as they didn’t have much involvement in the benchmark testing (their PR group didn’t even know about it during the testing) so it was cleaner this way. She was bossy and turned out to be a back stabber so my instincts were right. It was already going to be hard enough to work with multiple companies which turned out to be true, so this kept the cooks out of the kitchen. Moving her out of the announcement was vital to being able to get anything done at IBM. If you recall, there was bad blood between Microsoft and the IBM PC group since the beginning of the PC era (which Netfinity was a part of, until PC’s were sold to Lenovo). It was apparent from the start to the end of this process. I had to also keep the GM of Netfinity, John Callies out of the process as he was a useless suit whose ego commanded his actions which weren’t always good for the division. The GM of the overall PC Group was also hopeless (see the letter below) so I ran the process and kept the ego maniac suit and the helpless suit from ruining things. They were part of the old IBM who got their jobs through working the system rather than competence. It is part of executive ego managing, a tool that everyone needs to know when dealing with executives. The other PR teams jointly listed in the release didn’t have the spirit of the announcement as their focus, rather it felt like we were in the cold war. This happened even though IBM did all the work (it was built and conducted by IBM technicians, then independently verified by the TPC committee) and handed to the other companies as a freebie. Back then, Microsoft then had the clout of IBM PR during the System 360 and initial PC days when they were king of the hill and could (and did) throw their weight around. As I recall, there were over 30 revisions of the press release before we got to the final (below). It seemed as though every word was contested. This is how it went; I’d send a press release draft around which had the details giving all parties credit and explaining the products and process. A few days later I’d get back a draft which talked about Microsoft with relatively little mention of the process or an understanding of why the benchmark mattered to database users. It was a combination of elbowing IBM out-of-the-way to get headlines and a general lack of understanding of what we were announcing. Intel went along with us as they were confident in our ability to make a successful announcement. The negotiations went on for about 3-4 weeks prior to the announcement until 2 days before the big day. We couldn’t agree to the verbiage and finally Wagg-Ed suggested that we just each write our own press release. While I disagreed with this strategy, we actually agreed to it just to make the deadline and got it approved by the IBM executives. I didn’t want to do it as this inherently would present problems like why are there 2 separate releases if the companies are working together? However, since I knew the reporters I knew I was going to tell them the background off the record. I fully understood that a press release is merely a place holder and a conversation starter. No self respecting reporter would use someone else’s words if they were worth their salt. Only the companies really care what it says. The announcement was to be made on a Monday which we could agree on for effect (good PR tactics in those days, especially with IBM/Microsoft/Intel vs. Oracle in the headlines). Our final joint call occurred the Friday before the announcement and was attended by PR teams, spokesmen and company executives (note this was the first time I recall an actual Microsoft executive on these calls). It was on this call that a Senior VP from Microsoft (who reported to Ballmer and Gates) stated through his heavy French accent that having two press releases was a stew-peed idea and which idiot suggested it (I agreed with him). I pointed out that it was Microsoft’s idea which we accommodated. I’ve rarely heard such a gasp of silence as all parties realized what was going on. They quickly agreed to do a joint release and we cobbled together what to me was a very neutral (and useless) document. I silently was grateful that he asked this question that I’d pondered the whole time I dealt with this crew. I had known the whole time that this was a press release wording struggle and the real work was going to be done in the one on one’s with reporters after the press release hit the wires. I also was informed that Microsoft was only going to speak with a couple of magazines they viewed as their buddies. I agreed and kept quiet as I knew that this left the door open for us to lead the announcement. One has to have one’s priorities in focus and getting proper coverage was mine. I knew the reporters they wanted to talk to and they wrote my story and told me they didn’t like how pushy the W-E PR team was. See the part about relationships. It is important to note that a press release is merely a document to get an interview except when a wire service will run it early hours to beat a deadline. It is the relationship that the PR person has with the reporters that is the key to getting results. It didn’t hurt that so many big names were seemingly working together on this and that it had the element of controversy (IBM teams with Microsoft and Intel to beat Oracle) which is a headline grabber. It was then that I knew that things would work out despite our differences. For strategic purposes, I saved the IBM draft version of the release and used it for my press work as it described more accurately what we were doing, including a better presentation of how Microsoft and Intel contributed. Since Microsoft was only interested in the press release and thought they would get minimal coverage, I didn’t bother telling them and they didn’t care past the document. It turned out that the IBM team did the bulk of the publicity work (we had the most invested so no surprise). There was only a few joint calls with Microsoft and Intel where the executives touted the significance of this benchmark and during which everyone worked together like professionals. After hammering the phones and working with reporters for days, we received thousands of articles which was a shock to the other PR teams, especially Wag-Ed. While they tried to claim coverage, it was heavily nuanced to the IBM side of the story as we did the actual work both in the test and in the PR effort so no one believed Microsoft’s Wagg-Ed team. I worked with most of the reporters who covered it to give them the real story of the benchmark, and just left the press release controversy alone. I even fed them the line that we “Blew the doors of the TPC benchmark” which got printed and made it to the halls of Armonk. While I was glad it was over, I learned a great deal about working with others such as keeping the big picture in focus. It was one of the years largest announcements for our group and garnered massive coverage. I received my one and only personal email from Lou Gerstner praising the results. He stated that he had no interest in bake-off’s, but that this one was significant given what we had accomplished. This meant a lot as I thought Lou was one of the two best executives I had worked with at IBM, and I had a great deal of respect for his saving and running IBM as a company. I also received a personal note from the head of our division. The reality was that the IBM PC group had managed to fall to about sixth in the industry by then behind the likes of Dell, Compaq, HP, Acer and E-Machines, and this was one of the more competent things the group did while I was there. If you go to the link at the top of the page, you find that the Analyst joint announcement I did with Oracle was a far better experience, go figure. I received a personal note from the GM however. Note that he got my name wrong which caused me to chuckle and save it for the memories. Execs like Callies and Thomas cost IBM market share and progress. It was surprising that the doors opened some days in the PC division with people like that running the place. It is an indication of why they were 6th behind companies that didn’t exist only a couple of years later. The division fell off the map at IBM and was sold to Lenovo who took it back to the top of the industry. Overall, it was tenacity over talent, execution over ego but it is how the game is won. IBM, Intel and Microsoft announced the world’s fastest server cluster for commercial use, recording performance levels that triple the performance of Oracle running on a Sun Microsystems cluster, at one-third the price. Using the performance measurement technique agreed to by all computer makers (TPC-C), this alliance of leaders in industry standard computing achieved record-breaking results in server and price performance. IBM, Intel and Microsoft joined forces on this groundbreaking effort to prove that a combination of Netfinity Servers with Pentium III Xeon processors running at 700 MHz (megahertz) with 2 MB (megabyte) L2 cache, IBM DB2 Universal Database and Microsoft Windows 2000 Advanced Server operating system provides a highly scalable environment. This technology combination is ideally suited for data-intensive applications like business-to-business (B2B), e-commerce and Enterprise Resource Planning (ERP). The configuration included an unprecedented 116 terabytes of physical disk space configured for high availability using RAID 1 and RAID 5 arrays. The Netfinity 8500R servers, containing Netfinity X-Architecture features adopted from IBM S/390 and RS/6000 servers, contributed to this benchmark’s success. Specific features that convinced the benchmark team the servers were up to the test include the 8500R’s expansive memory, the number of processors supported, the number of PCI slots available for add-on components and the amount of LAN I/O for the transfer of data in and out of the system. In addition, the setup utilizes Giganet cLAN interconnects for fast server-to-server communications. 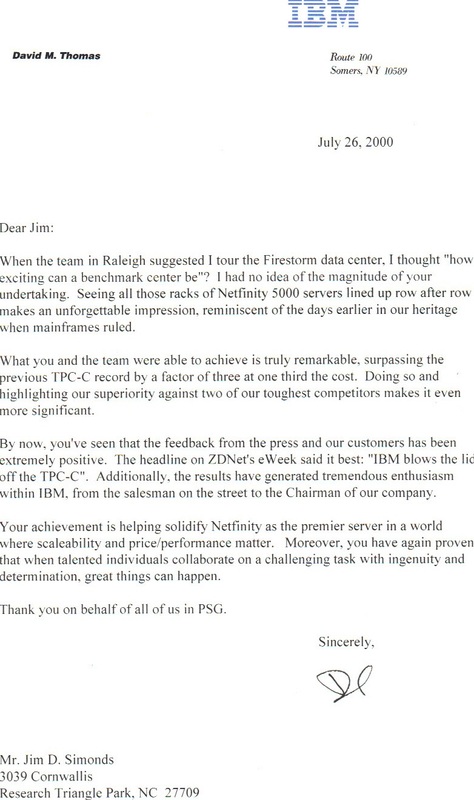 96 IBM Netfinity 5000 servers were used as TPC-C clients for the Webserving, Microsoft Windows 2000 Advanced Server on each client. This announcement highlights IBM’s leadership in the database market. DB2 demonstrated record-breaking results in transactions and in the ability to manage the world’s largest database of more than 116 TB of online storage – this is equivalent to a stack of paper 3,480 miles high. A proven foundation for B2B applications, DB2 Universal Database Version 7 integrates breakthrough technologies that enable customers to slash development in many cases nearly in half and perform high-speed text searches as much as ten times faster than traditional relational database search engines. Microsoft Windows 2000 Advanced Server was configured using a scale out approach to run on each member of the cluster of the Netfinity servers. Scale out architecture ensures that customers creating enterprise solutions will be able to achieve the highest possible levels of scalability and reliability with unmatched price and performance; this benchmark is further evidence of the performance, scalability and economic advantages of the results that can be achieved using Windows 2000 Advanced Server. COM+ is a complete, mature set of component services for quickly building scalable, reliable applications that is delivered in the Windows 2000 Server family of operating systems. COM+, the most popular component model in the world, includes critical scalability and reliability features necessary for building large-scale applications by integrating the features of the Microsoft Transaction Service (MTS) deep into the COM component model. This integration makes it easier for developers to create and use scalable software components in any language, using any tool. Windows 2000 Advanced Server is a solution that includes additional functionality to enhance the availability and scalability of e-commerce and line-of-business applications. The Windows 2000 operating system is the ideal platform for the next generation of business computing; helping organizations Internet-enable their businesses with a reliable, manageable infrastructure that is optimized for existing and emerging hardware. The new large cache 700MHz version of the Pentium III Xeon processor has a record 140 million transistors. The processor is based on Intel’s advanced 0.18-micron process technology, and offers 1MB and 2MB of Advanced Transfer Cache memory with Advanced System Buffering, which boosts performance by placing a full-speed, level-two cache memory directly on the processor die and increasing the width of the data pathway to the processor. The processor also offers a 100 MHz system bus and on-cartridge voltage management for increased system reliability. The new processors also are built on the same form factor, enabling server manufacturers to use them with existing server platform components, accelerating time to market. For more information about: — IBM Netfinity servers and DB2 Universal Database, visit www.ibm.com — Intel, visit www.intel.com — Microsoft, visit www.microsoft.com. The Transaction Processing Performance Council is a non-profit corporation founded to define transaction processing and database benchmarks and to disseminate objective, verifiable TPC performance data to the industry. Founded in 1975, Microsoft is a worldwide leader in software, services and Internet technologies for personal and business computing. The company offers a wide range of products and services designed to empower people through great software — any time, any place and on any device. Sun’s Enterprise 6500 cluster achieved 135,461 transactions at a price performance of $97.10 tpmC. IBM, Intel, Microsoft cluster achieved an audited record attested to by TPC-C (Transaction Processing Performance Council, type C benchmark) of 440,879.95 transactions per minute at a price performance of $32.28 per tpmC. Data is current as of July 3, 2000 and is subject to change without notice. For the latest benchmark information, visit www.tpc.org. Solution specification, pricing and availability information is subject to change without notice. Contact John Simonds, IBM, 919-254-9732, jsimonds@us.ibm.com or Deborah Young, Waggener Edstrom for Microsoft, 425-637-9097 deborahy@wagged.com.